NRDC (the Natural Resources Defense Council) announced today that the Rolling Stones will perform a special free concert to raise awareness about global warming on February 6, 2003 at Staples Center in Los Angeles, CA, USA. Fans can enter a sweepstakes to win two free tickets by completing the entry form at the NRDC Stones Concert pages. For more information see NRDC presents the Rolling Stones. Also, see the Reuters report. Dec. 20: RS Fan Club tickets available now! Just before midnight Central European Time today the Rolling Stones Official Fan Club released "Get Tickets" for many sold out shows, in fact most shows except for the clubs. Fan club tickets are now available for Wembley, Ahoy, Globen and many other sold out venues. All it takes is an international fan club membership at $95, and you have access to these tickets for one venue of your choice. See the official Rolling Stones 2003 Tour pages for ticket availability. PS. They may sell out soon, and they may not have maximum (4) tickets available for your show. Try at your own risk, and talk about your experiences in the IORR Tell Me section. The Rolling Stones are expected to play another ten or so shows in the Far East region following their visits to Australia and Japan. The shows will be in China, India and more countries in the region. See the IORR 2003 tour dates as these dates for the last part of March and first half of April will be available soon. The Rolling Stones broke all Austrian ticket sales records today as they sold 20,000 tickets for the June 18 show at the Ernst Happel Stadion in a few hours this morning. All others Austrian summer 2003 show ticket sales started weeks ago. Bon Jovi and Springsteen are still not sold out, while Robbie Williams took 2 weeks to sell out for the same stadium. It is expected that the Stones show will be sold out by Sunday or Monday, according to Austrian radio OE3. See ORF.at. The Rolling Stones show at Ernst Happel Stadium show in Vienna, Austria, June 18 is now confirmed. Pre-sales of tickets on Dec. 20 at 9:00 from �sterreichTicket. Dec. 14: Get your European tickets now! German shows are now on sale through RollingStones2003.de. Also, pre-sales are available from RollingStones.com for Germany, Copenhagen, Helsinki, Amsterdam and more shows. Dec. 13: Far East tour expanding to Singapore? The Rolling Stones are talking to Singapore authorities about two shows at the 12,000 capacity Singapore Indoor Stadium. Also there are rumours about shows in India, probably as they leave Japan to do more shows in the Far East region late March. Ryan Adams will be the guest artist for most of the Stones shows in January, starting with Pittsburgh Jan. 10. See Ryan-Adams.com. The Rolling Stones have confirmed two more shows in the Netherlands Amsterdam ArenA, going on sale tomorrow Dec. 14. The shows are scheduled for Aug. 19 and 20. See TicketService for tickets. The four Australian shows in Sydney (club + arena), Melbourne (arena) and Brisbane (arena) sold out in 30 minutes today, and more shows have been confirmed for Sydney and Melbourne. See Tiketek and the IORR 2003 tour dates. If the tickets for the Stones show in Helsinki July 16 go fast on Monday, then they might add another show for Finland, probably on July 15. See Expressen. The correct and confirmed dates for The Rolling Stones in Germany are the ones you see in IORR. For more information see Yahoo Finanzen, Yahoo Music and DEAG. Tickets go on sale Thursday Dec. 12 for Hannover and Leipzig, Friday Dec. 13 for Hockenheim and Oberhausen, and Saturday Dec. 14 for Berlin and Hamburg, all at 9:00 in the morning. See the site RollingStones2003.de for tickets, availability etc. The Rolling Stones stadium show in Parken, Copenhagen, Denmark on Sunday July 13, 2003 has been confirmed. Tickets go on sale Monday Dec. 16 at 10:00 in the morning, see BilletMaskinen. The Rolling Stones announced four shows in Japan this morning, two in Tokyo Dome Mar. 15, 16 and two in Osaka Dome Mar 20,21. See conformed dates in the IORR 2003 tour dates list. For details about ticket sales see the IORR Stones in Japan 2003 information. There will be more shows in Sydney, Melbourne and Brisbane, Australia, as the pre-sales of more shows are actually available from VISA Preferred Seating in Australia. See additional dates in the IORR 2003 tour dates list. Even if many Stones shows in Europe sold out in minutes through the public sales, there are still available tickets to many arena and stadium shows through the official RollingStones.com. All you need is an international premium membership, giving you access to fan club tickets for one show. The Helsinki stadium show in Finland is confirmed for July 16, with ticket sales starting on Monday Dec. 16 at 9am. See Well Done Helsinki. The internet pages of the Swedish ticket sales were overloaded, and still are, as they sold out all three shows in 30 minutes this morning. There are rumours of another show at Globen or Stockholms Stadion. See Expressen. Dec. 9: German ticket sales tomorrow? The Munich club and arena shows sold out in minutes on Saturday, while you can still get tickets to the Munich Olympiastadion. Other shows are said to be on sale tomorrow, see German shows by GetGo. PS. Some of their dates may be wrong, see the list of IORR tour dates 2003. PPS. They have had some computer access problems. If they fail then try again later. The first four shows in the Netherlands sold out in 90 minutes, i.e. one club, one arena and two stadium shows. The Dutch promoter MOJO confirmed the first of possibly more shows at the Amsterdam ArenA on Aug. 19, with ticket sales starting Saturday Dec. 14 at 10am. See the IORR 2003 tour dates. The public sale of tickets to the first three Rolling Stones shows in London went on at 9am UK time this morning. The London Astoria club show and Wembley Arena were both sold out in 15 minutes, while it took two hours to sell out the 50,000 capacity Twickenham Rugby Stadium. A fast sell-out will probably reward the UK fans with more shows, as told before by IORR. See the BBC news for details. It took a while, but the set list of the private show at the Joint on Nov. 16 has finally been verified. See the confirmed Joint private show setlist and show report. If you can't make it to the MSG re-scheduled show on Jan 16, and have a ticket for Jan 17, then you should make it available to other fans at face value on the IORR Ticket Trader rather than just returning it to The Garden. Tickets for the Rolling Stones show at the Olympic Stadium in Munich, Germany may be reserved now from Eventim. PS. It is just a reservation; they will not go on sale until Saturday. A show in Prague, the Czech Republic might replace the show planned for Budapest late July next year. The Prague show will be at the record capacity Letenska Plan, a large square/place located in Letna, close to the Sparta Prague fooball stadium, with a capacity of some 200,000 in previous shows, and a record crowd of 800,000+ people during the revolution in 1989. Tickets for the Rolling Stones shows in Australia go on sale Wednesday Dec. 11 at 9am. 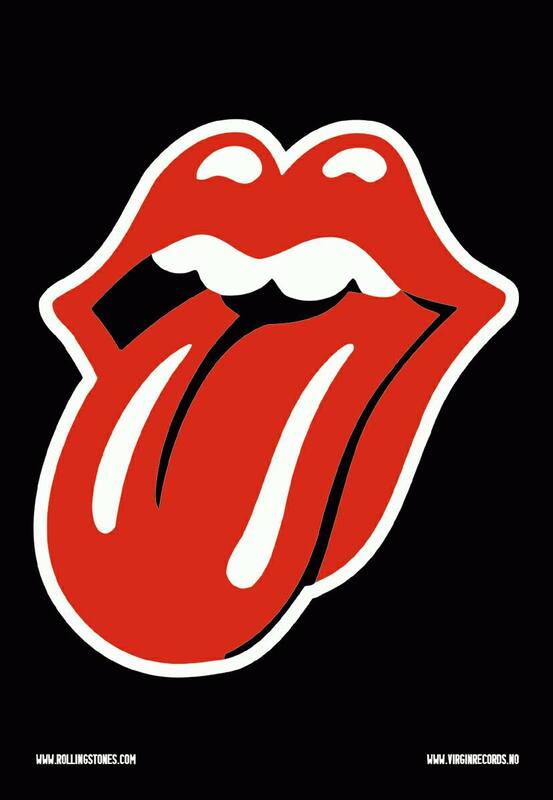 Pre-sales of tickets will be available from the official fan club RollingStones.com any time now. Ticket prices will be in the range AU$ 67-350 See Ticketek for details. Tickets in the UK will go on sale Friday Dec. 6 at 9am, followed by sales in Holland on Saturday Dec. 7, Sweden on Monday Dec. 9 at 9am and France on Wednesday Dec. 11. German shows will also go on sale soon, some say Saturday Dec. 7, but this is not confirmed yet. Additional cities, venues and on-sale dates will follow soon, see the IORR 2003 tour pages. The show originally scheduled for Friday Jan 17 in the Madison Square Garden, New York has been re-scheduled to the new date Thursday Jan. 16. See the IORR 2002/2003 tour dates. The official fan club RollingStones.com is doing pre-sales of tickets, including club show tickets. See the IORR Tell Me pages for all the details. The Australian tour is confirmed tonight. There will be a club show in Sydney, plus several arena shows in Sydney, Melbourne and Brisbane. See the IORR World Tour 2003 pages for details. India and China dates may not happen, still no news. The official fan club RollingStones.com is announcing pre-sales options of tickets to Premium members. Tickets go on sale during the next few days for the various cities. Make sure you have telephone or internet access by then. It seems telephone is the only sales channel for club show tickets. Details and advices to follow soon here. The pre-sales give you a code to use for buying a limited number of tickets to one show only. If you want more shows, then more memberships will be needed. The Rolling Stones are announcing visits to the following countries and cities in Europe next summer: Switzerland, Denmark: Copenhagen, Finland: Helsinki, Austria: Vienna, Germany: Munich, Berlin, Hamburg, Cologne, Leipzig, Italy: Madrid, Spain: Barcelona, Czech Republic: Prague, Yugoslavia: Belgrade, Croatia: Zagreb, The Netherlands: Amsterdam, Utrecht and Rotterdam, France: Paris and Marseille. Details of dates and shows will be announced soon. See the IORR World Tour 2003 pages for details. So far the only German shows confirmed are the stadium, arena and club shows for Munich. But they say the rest of the German shows will be announced on Wednesday by the promoter DEAG Entertainment. Tickets for the stadium, arena and club shows in Sweden go on sale Monday Dec. 9 at 9:00 in the morning. Stockholms Stadion seats SEK 820 (Euro 90), field (standing/open) front SEK 670 (Euro 75), back SEK 495 (Euro 55). Globen seats SEK 920-470 (Euro 100-50), standing SEK 620 (Euro 70). Ticket sales through Ticnet Sweden for stadium and arena. Circus club tickets SEK 500 (Euro 55) through phone sales only telephone +46 8 660 10 20. See information by the promoter EMA Telstar. The Rolling Stones tour in Europe 2003 has been made official today. Most of the rumoured dates in the IORR World Tour 2003 pages were correct. See CONFIRMED dates for Munich, Paris, Stockholm, Rotterdam, Utrecht and London. Tickets in the UK will go on sale Friday, December 6th, followed by sales in Holland on December 7th, Sweden on December 9th and France on December 11th. Additional cities, venues and on-sale dates to be confirmed. The world tour announcement has been delayed some times, but it seems like Sunday (Australia) and Monday (Europe) is quite probable for the tour announcement, with ticket sales starting a few dates later. See the IORR 2003 tour dates for updates. Keith Richards is on the cover of the UK magazine Uncut, December issue. Also, there is a CD with the magazine, with his favourite songs; blues, soul and R&B classics. It might not be the European tour opening, but it is still confirmed by Austrian officials today. The Rolling Stones will play at the 48,000 capacity Ernst Happel Stadium on Wednesday June 18, 2003. Tickets go on sale Monday Dec. 2. That means we will have an official tour announcement within two weeks from now. See the list of rumoured and confirmed 2003 tour dates by IORR. The IORR list of rumoured tour dates in Europe 2003 has been updated. Watch out for possible club shows in Munich, Paris, Stockholm, Amsterdam and London. The world tour dates will be officially announced within few days/weeks from now. The Rolling Stones did a private show at the Joint, Hard Rock Hotel, Las Vegas last night. The new Don't Stop video has just been finished by the Swedish company Stylewar. It is based around three guys who want to see the Stones. It's like an animated roadtrip with real persons playing the characters, as they have references to older Stones songs such as "Sympathy For The Devil" and "Paint It Black". See the first pictures from the video in Swedish Expressen. MTV3 in Finland will broadcast a 50 min TV special titled "Rolling Stones: 40 Licks" on Monday Nov. 18 at 23:15. Also, the radio station RadioCity in Finland is having a "Stones weekend" on Saturday/Sunday. Just as the Stones finished three shows in the San Francisco Bay Area, they have now confirmed a new show in San Jose, CA for Feb. 4. Pre-sales currently through RollingStones.com. See complete LICKS world tour dates in IORR. Bill Wyman will be interviewed on German TV SAT 1 during their morning broadcast tomorrow Thursday Nov. 14 at 5:30am - 9:00am. More book signing and promotional dates for Bill Wyman, presenting his new book in Hamburg today and Berlin tomorrow. See the Rolling With the Stones promotional tour details. Bill Wyman will do a press conference at the Amstel Hotel, Amsterdam on Friday Nov. 15, followed by a small party. Bill will receive the first Dutch copy of his new book then. The day after, on Saturday, Bill will be signing his new book Rolling With the Stones at the Beurs van Berlage. Bill Wyman will be in Munich, Germany on Thursday Nov. 14, opening an exhibition of photos taken from his new book Rolling With the Stones. The location is the Gasteig Theater, Rosenheimerstr. 5, Munich, at 8:30pm, entrance fee 7 Euro. The Rolling Stones tour in Europe will be handled by local promoters, and dates will probably be released in blocks, during the next four weeks. Web sites to follow closely would be RollingStones.com plus ClearChannel Europe. PS. The same would be valid for the rest of the world tour. It seems like the puzzle of setting up the Nordic shows next summer takes time. Stockholm (Sweden) might get three shows in a stadium, arena and club, while Finland, Norway and Denmark might get one show each, all in the mid-July time frame. See details in the IORR 2003 tour dates pages. Spanish TV is confirming unofficially that the Stones will play three shows in Spain next summer, in Barcelona, Madrid and Benidorm. See details in the IORR 2003 tour dates pages. The exclusive party held in Beverly Hills, Los Angeles on Sunday Nov. 3 were done to present the new Rolling Stones Rockwear collection. See reports in Rolling Stone magazine and RTL. The Rolling Stones have confirmed another show at the Los Angeles Staples Center on Thursday Feb. 6. Pre-sales of tickets will be done through getAccess. See the 2002-03 tour dates. Teamsters pledged Monday Nov. 4 to shut down the two Rolling Stones concerts this weekend at Pacific Bell Park if the promoter, Clear Channel Communications, does not agree to use union workers. See Pollstar and Yahoo for details. The dates of the Rolling Stones world tour, including Asia, Australia and Europe, was supposed to be announced by the end of October, but a new date of the announcement is said to be Nov. 15. The Stones played their first of three shows in Los Angeles at the Staples Center arena on Thursday. Today they will do the stadium show at the Edison Field, and on Monday they will play the Wiltern Theatre. Tomorrow they are throwing an exclusive party for 300 people at Trader Vic's, a restaurant attached to the Beverly Hilton Hotel. The new Stones book "Love You Live, Rolling Stones: Fanfare From the Common Fan", written by Marilou Regan and Hans Oosterbaan, is a new book just out now. This great book features a collection of stories and photos by fans on the road with the Rolling Stones for four decades. The book is presented from their fans' perspective and features hundreds of never-before-published photos. For more details and to order the book see the new Love You Live web site. Bill Wyman is currently in North America promoting his new book Rolling With the Stones. Yesterday Bill did book signing at the "Book Revue" in Huntingon, New York. In a 20 minutes Q&A session Bill confirmed he might indeed accept going on stage with the Stones again, if they asked him, but only in England. Today Bill will be signing his book at Borders Books & Music, White Plains, NY, at 7:00pm. The Rolling Stones are featured in the latest NBA television ad as part of the basketball organization's "Love It Live" campaign. The 30-second spot debuted on cable's TNT last night during the NBA opening game, featuring 30 seconds live of "Don't Stop". The Stones spots will continue to air throughout the 2002-2003 NBA season. See Launch Music on Yahoo for details. Ronnie has organized exhibits of his art in Los Angeles and San Francisco. The L.A. exhibit is at Hamilton-Selway Fine Art, 8678 Melrose Ave., West Hollywood. A media reception will take place this Friday at 11 a.m., followed by a private opening reception at 6 p.m. In San Francisco, his work will on display at the San Francisco Art Exchange, 458 Geary Street. Private, invitation-only receptions will be held on Sunday Nov. 10 and Monday Nov. 11, both from 6-9 p.m.
Waddy Wachtel plays every Monday night at the Joint in West LA on Pico St., a tiny place that holds may be 100 or so people. Last night he was joined by old pal Keith Richards, just arriving to Los Angeles to do three shows during the next seven days. Keith joined the band for a 3 song jam. They played "Key To The Highway", then "Jumping Jack Flash" and "Start Me Up". Bernard Fowler and Blondie Chaplin also joined in. The Stones show in Zagreb 1998 was such a great success with 76,800 Croatian fans attending, that they got a new show for the 2003 tour. The date is Sunday Aug. 3, and the venue is the 70,000 capacity Maksimir Stadium, as confirmed by the promoters as well as the town council. See the reports in Iskon and VIPonline. Florida got two arena shows in two days, as the Stones played in Sunrise near Ft. Lauderdale two days ago, and Miami last night. For both shows they went directly from the small stage into the last song "Jumping Jack Flash" on the main stage, without performing any encore, and in Miami they did the first appearance of "That's How Strong My Love Is" in a larger venue, following the theatre debute at the Roseland Ballroom show in New York three weeks ago. The latest issue of Maxim Fashion has Mick Jagger on the cover with a 6 page article (2 pages interview, 4 pages photos of Mick in nice shirts). Don't expect Bill Wyman to re-join the Stones, but in a recent interview Bill actually admits he is waiting for the Stones to call him, and if they call, then he would probably join them on stage one more time, as it is the 40th anniversary tour. See the Reuters report. Bill Wyman introduced his new book Rolling With the Stones at Selfridges in London on Monday Oct. 21, and will do a tour of book signings in UK and Europe during November, starting at Harrods, London Nov. 4. See list of events, special offers and book information in the new IORR pages Bill Wyman - Rolling With the Stones. Local tour promoters, sponsors and ticket agencies in Europe are leaking tour dates as they proudly get their contracts, while the Stones tell them to keep silent for still another week. Australian dates are said to be announced on Oct. 29, may be the rest of the world tour as well. The first Amsterdam date on sale might be Aug. 16, with more more dates to come. See the World Tour 2003 dates by IORR. The book Rolling With the Stones written by Bill Wyman is launched all over the world today. Many non-english spoken countries have a local language edition published - check your leading bookstores for campaigns today. The Rock And Roll Hall Of Fame And Museum in Cleveland is opening an exhibition of Ronnie Wood art to the public today, following a private preview yesterday. New items includes set lists written by Ronnie Wood in Toronto, for the rehearsals this summer. See the Launch news. The UK magazine UNCUT current (November) issue has got a 7 page Stones article promoting the remastered albums, with Mankowitz photos. Also a review from the Fleet Center. Next month's issue, on sale November 7th, will feature an "exclusive" interview with Keith Richards with his "hand-picked" choice of tracks on the CD. BBC Radio 5 in UK will broadcast "Radio Five Live" today at 12:30pm, i.e. at noon time, 13:30 Central European time. BBC Radio Five Live has been granted the only radio interview in the World with the Rolling Stones, conducted in a New York Hotel Suite on Friday Sept. 27, the day after their MSG show. The UK TV station BBC 2 will broadcast "Fame Set and Match" tonight at 9:15pm UK time, a programme about 40 years of the Stones told through the eyes of Marrianne Faithful, Anita Pallenberg, Bianca Jagger, Jerry Hall and Mandy Smith. This is followed at 10.15 by a "Top of the Pops" special of the Stones filmed 2 weeks ago when they were in New York. Oct. 10: Rumoured Jan. show in Philly or 3rd MSG? There will probably be one more Stones show in Jan. 2003, between the Boston and MSG shows. It is still unclear if it will be Philly FUC Jan. 14 or MSG 3rd show on Jan 15. It's old news now, but just in case you missed it, the UK magazine MOJO October issue is dedicated to the Rolling Stones, with four different front covers, each with Mick, Keith, Brian and Charlie+Bill on the front. Inside they are identical, still interesting articles. The major of the tourist city Benidorm in Spain yesterday confirmed the Rolling Stones will play his city on July 1st next year. Also, expect the Stones to visit Barcelona at one of Europe's largest football stadiums in Barcelona, Olympic Stadium, around June 26. Some dates are still a bit unclear, but it seems like the tour will start in Vienna, then go through Munich, Milan and then several shows in Spain. Final details are expected within 1 - 2 weeks from now. "Forty Licks" debuted at No. 2 on the U.S. pop album charts with sales of 309,832 units in the week ended Oct. 6. Elvis Presley's "Elv1s: 30 No. 1 Hits" held onto the top slot for a second week with 336,662 units. The Stones haven't had a No. 1 album in the United States since "Tattoo You" in 1981. See the Mark Fisher Studio pages for great photos of the Licks stage designs, and also of the previous Stones stages done by the same designer. Mick Jagger has donated �100,000 to his former school Dartford Grammar School, to support fostering new musical talents. It will be spent on the Red Rooster project at the school's Mick Jagger Centre to encourage more children to start making music at an early age. See BBC News. Oct. 7: Bob Dylan performing "Brown Sugar"
While the Stones do their own Bob Dylan cover song live through "Like A Rolling Stone" at times, it seems like Bob Dylan has added "Brown Sugar" into his live set on the current tour in USA, as performed in Seattle and Eugene last week. "40 Licks" debuted at No. 2 on the U.K. pop album charts, kept out of the top spot by "Elv1s -- 30 Number 1 Hits." In the United States, where Elvis Presley is also No. 1, first-week data for "40 Licks" will be released on Wednesday. "The London Howlin' Wolf Sessions," the 1971 album that featured Charlie Watts and Bill Wyman (along with Steve Winwood and Eric Clapton) will be reissued with bonus tracks in North America on Nov. 19. Universal Music's 2-CD package boasts a newly 24-bit remastered version of the original album as well as newly remixed versions of three tracks from "London Revisited," the 1974 leftovers collection; 12 previously unreleased tracks -- 8 newly remixed from the original 16 track sessions tapes and four from original 1970 Mixdown sessions; lengthy in-studio dialog on "Who's Been Talking? "; and original artwork and lyrics, plus extensive new liner notes. 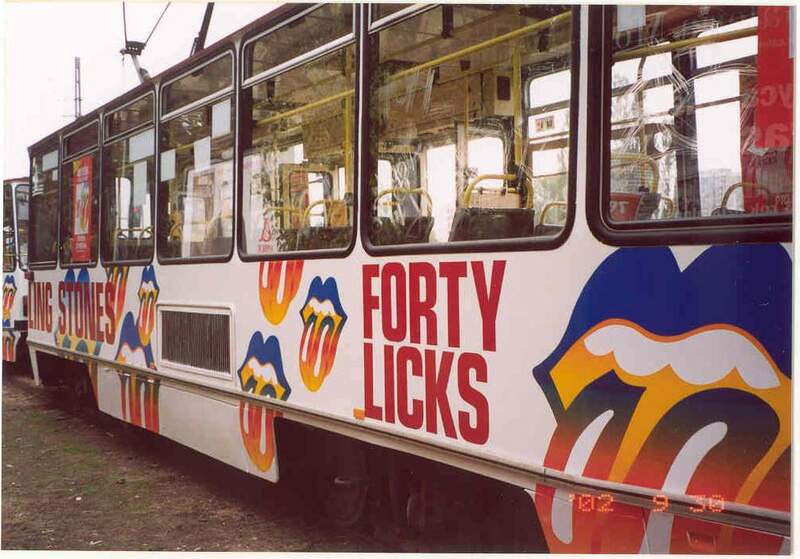 The new Stones album Forty Licks has been getting some great marketing around the world. 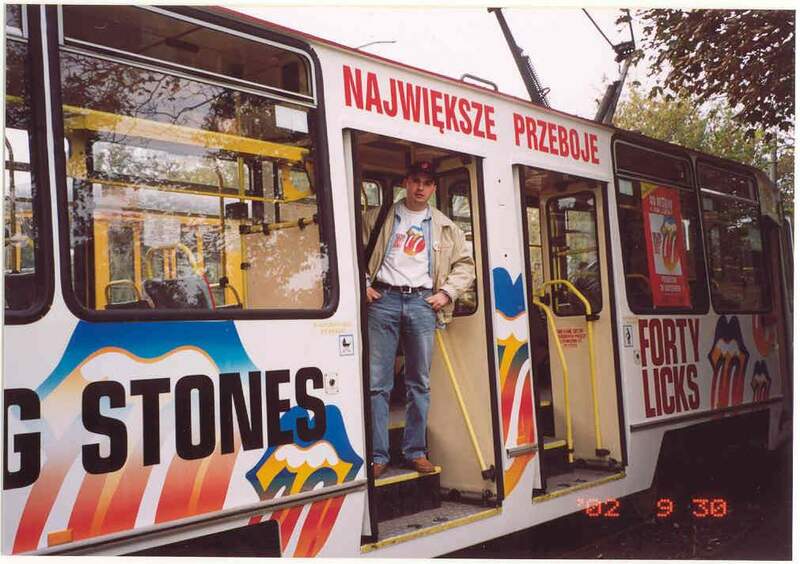 In Warsaw, Poland they did the launch by running "Forty Licks" on the city tram, and bonus attractions once you boarded the tram. If you really collect everything Stones related, then you probably need some extra space for a a complete set of this one. 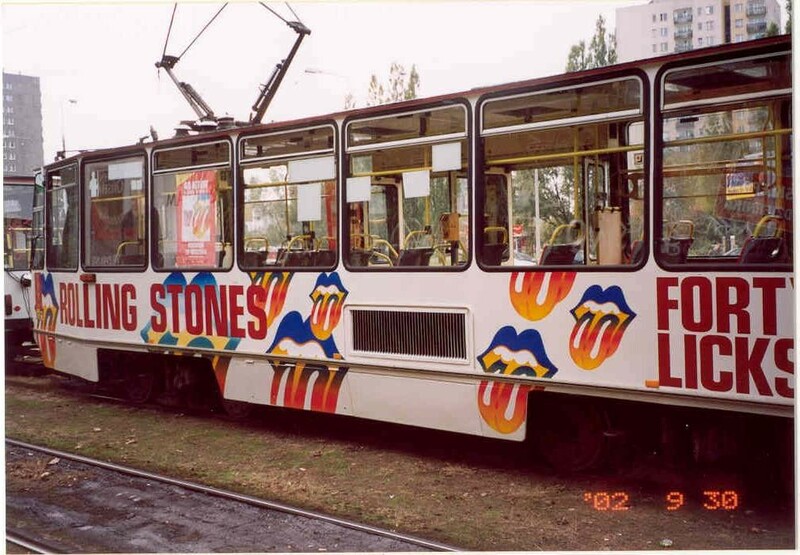 See the tram, and also with a real Stones fan of course. The Rolling Stones performed a great set of four songs from the album "Let It Bleed" at their show in Hartford last night. Another fantastic show, as the tour and the band is getting better and better. Now they will take a break before moving on to Detroit. Within few days after the new Stones album Forty Licks is being released, USA Today (yesterday edition) is bringing statements from the band regarding the next studio album. They have 30 songs to work on from the Paris recordings in May/June. Mick: "I don't remember how much is actually finished. When the tour gets to like clockwork, we can work on some of the songs on the road". The Rolling Stones were featured on the U.S. TV broadcast "60 Minutes" last night. See references on the CBS News pages. The Rolling Stones performed such great and rare songs as "She Smiled Sweetly" and "That's How Strong My Love Is" at the Roseland Ballroom theatre in New York City last night. Keith said it was a "good room", Mick did a killer performance of "Midnight Rambler", Ronnie did again show his excellent guitar playing all through, and Charlie was louder than ever before. The Rolling Stones performed at the Giants Stadium last night. This was the debute of the new stage design for the stadium show, and also for a new tour program. No more yellow colors and corn, now it's a very different look of the stage, as well as of the new tour program cover, and the stage photo inside. See show reviews and the new stage design photos in the Giants Stadium pages. First Ronnie Wood opened his art exhibition at the Pop International art gallery in New York. Then the Rolling Stones performed at Madison Square Garden, a sold out show everybody wanted to see - a real hard ticket! Now they are off to the Giants Stadium today, for the stadium show, before they kiss New York goodbye for this year at the Roseland Ballroom club show. Rolling Stone magazine issue 907 is confirming a private multi-million dollar show by The Rolling Stones for a Texas Pacific Group at the Joint, Hard Rock Hotel, Las Vegas on Nov. 16. The new fan club magazine IORR 45 was mailed out on Friday Sept. 20, and should arrive to all IORR members and subscribers this week. The magazine is featuring the LICKS tour opening, rehearsals and club show in Toronto, opening shows in Boston, reviews, great and rare photos, and other news and important informatiuon for Stones fans and collectors. Sept. 26: European tour to open in Vienna June 19? The LICKS 2003 tour in Europe is rumoured to open at the Ernst Happen Stadium in Vienna, Austria on June 19, 2003. Expect the rumourded dates to change slightly, as the updated schedule of shows is being fixed, and announced publicly late October. Finally it is on the streets in USA, the Rolling Stone magazine issue 907, dated Oct. 17, featuring Keith on the cover. The article is titled "Dancing with Mr. D". It's a great interview with Keith, where he is saying "Don't Stop" was basically written by Mick, and with the final quote: "If you want to live a long life, join the Rolling Stones". Also in this magazine, a concert report with a brand new photo of Mick and Bono in Chicago. See the special RollingStone.com page Stones35, with the Keith article, and lots of old and new links to 35 years of Rolling Stone articles on the Stones. Chicago is getting a Rolling Stones show number two at the United Center on Jan. 22, and the show is on sale now, through pre-sales from RollingStones.com. Following three great shows in Philadelphia, the Stones are noe ready for another three shows in the New York City area, staring with Madison Square Garden on Thursday Sept. 26. For the Philadelphia shows see the reviews of the Veterans Stadium, First Union Center and Tower Theatre shows. Sept. 22: India next for the Stones? The Rolling Stones have been planning to play in China, probably one or more of the cities Beijing, Shanghai and Hong Kong, arena (indoor) shows. Once they are in China, the cost of doing India as well would not be that high. Playing India is not just a dream, not just a rumour, it might actually happen next year, in the Feb/March time frame. See The Times of India. The TV cable company HBO in USA is supposed to be broadcasting the Rolling Stones show on Jan. 18th at Madison Square Garden, New York. Expect guest artists for this show, like with previous PPV shows, including the 1997 PPV show in St. Louis. Ticketmaster is now selling tickets to both Jan. 17 and Jan 18 Madison Square Garden shows, i.e. both shows are now confirmed for Jan. 2003. See the IORR LICKS pages for the complete list of tour dates. The September 30 issue of Fortune magazine is having a detailed report on the Rolling Stones, including interviews with Mick and Keith, where they talk about money, business, touring ticket prices, the partnership of the Stones and much more. Also, analysis of tour income and more. Very intersting. Also, see the Yahoo Finance report. Bono of U2 joined in on vocals when the Stones did "It's Only Rock'n Roll" in Chicago last night, while Dr. John joined in on "I Just Want to Make Love to You". Like at the Orpheum Theater in Boston, the Aragon Ballroom show in Chicago brought a different set list for the smaller shows. 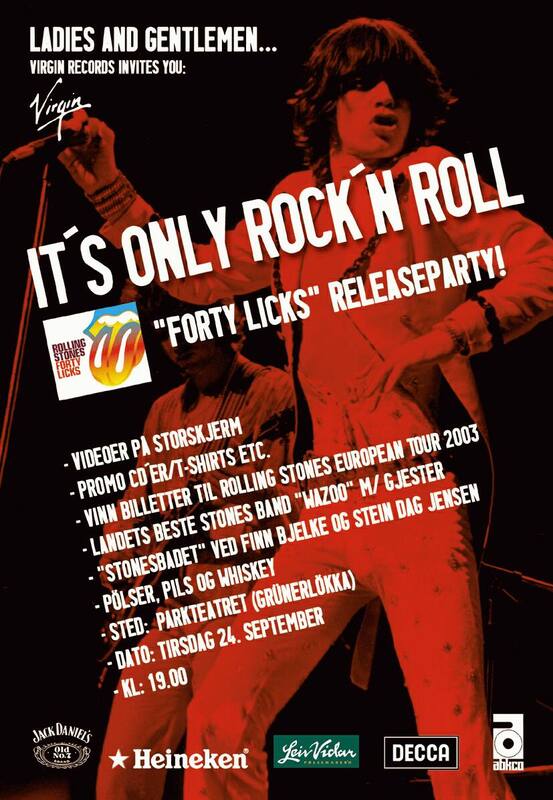 Virgin Records Norway are hosting a great Forty Licks release party in Oslo, Norway on Tuesday Sept. 24. You are invited! See the great party invitations front and back plus more details. Even if the LICKS tour dates for the 2003 world tour won't be announced until late October, you might be pleased to know that LatestEvents.com are now taking orders for travel to Marseille July 5 and Paris July 8. The fans seemed to enjoy the 2nd Rolling Stones show in Chicago at the Comiskey Park on Friday Sept. 13, even if they seem to have some sound problems on the upper stadium parts. Tonight it's time for another club show at the Aragon Ballroom in Chicago. If you don't have a ticket, and live nearby, then remember they gave out 25-50 tickets in Boston for the Orpheum club show. The Rolling Stones are adding another show at the Madison Square Garden in New York on Saturday Jan. 18. Pre-sales of tickets will start Monday Sept. 16 by GetAccess. If the Jan. 18 show is selling fast, then they might add another show for Friday Jan. 17. MSG, a.k.a. The Garden, is the venue played most times by the Stones, not counting early 60's clubs. Mick Jagger and Ronnie Wood visited Buddy Guy's Legends club in Chicago on Tuesday, and as Buddy Guy took the stage for a guest spot in his own club, it did not take long until Mick joined on stage as well, and soon after Ronnie stepped up, performing "Little Red Rooster". USA Today is featuring an article mixing old news from the press conference and more recent interviews with Mick and Keith, done in Toronto last month. Also, see the great photo gallery. The Sept. 14 issue of Billboard will feature interviews with Mick Jagger and Keith Richards, plus a general article on the new tour and album. In this interview Mick is confirming they will play both China and India next year. See Billboard for all three articles. The Rolling Stones show tonight featured a special set of songs from the "Some Girls" album including "Far Away Eyes", "Shattered" and "When the Whip Comes Down". Also, they did "Miss You". See the United Center reports. The Rolling Stones played their first club show of the LICKS world tour tonight. The show was unique, and so was the set list, featuring great songs like "Heart of Stone", "Parachute Woman", "Dance Pt. 1", "Hand of Fate", "Everybody Needs Somebody To Love" and more. See the Orpheum club show review. The Rolling Stones concert at the Joint, Hard Rock Hotel in Las Vegas, due for Friday Nov. 29, will go on sale tomorrow Saturday. This is the smallest venue of the official ones for this tour, with a capacity of 1,700 people only. Prices will be record high at $505, $755 and $1,005. See Las Vegas Review-Journal. "We will do this for the whole year", Mick said at the Gillette Stadium show tonight. While touring, the Stones have plans for recording a whole new studio album, to be released next year. Also, the boxed set of rarities is still in the plans. Meanwhile, enjoy the shows, the ABKCO re-releases, plus Forty Licks, due out Oct. 1 in USA. The Rolling Stones gave the fans their big hits at the Gillette Stadium show tonight, but also, they surprised by doing "Shattered", "Beast of Burden" and "Miss You" on the small stage, plus a cover version of the Otis Redding song I Can't Turn You Loose. The graphics were basic still great. See the review and setlist of the Gillette Stadium show. The Rolling Stones tour opening at the FleetCenter tonight in Boston was far more than the fans expected. Fears of a standard set list were blown away as they did amazing versions of songs from "Exile on Main St.", plus "Can't You Hear Me Knocking", plus "Don't Stop", the new single, "Love Train", and lots more. See the The Rolling Stones tour opening show review. The LICKS world tour is starting today at the FleetCenter in Boston. Like with the 1997-1999 tours, each and every show will be reviewed and reported through the IORR Licks dates & reviews tour pages, with the help from you. Please send your e-mail to IORR. Thanks! The new version of RollingStones.com just launched this morning Boston time, right in time for the tour start. The site is offering many new features - check it out! Following rehearals at the FleetCenter in Boston, the Stones moved into the brand new Foxboro (near Boston) located Gillette Stadium last night, as they were checking out state of the art sound and visual equipment, as well as songs. The rehearsals could be heard for miles in the area. Local residents though the Stones were played on their radios, but when Keith did a restart of one of his songs, they realized the band was in the neighborhood, and jumped their cars to see what was going on at the stadium. Security was tight, and nobody were allowed anywhere near the stadium. See the Boston rehearsals for details, as well soon to appear reports and reviews from the FleetCenter, Gillette Stadium and Orheum Theater concerts. The Australian concert promoter Paul Dainty is confirming a minimum of ten Rolling Stones shows in Australia during February and March next year, according to an article in the Australian Sunday Telegraph today. There will be selected stadium, arena and club shows, just like in Boston, Chicago, Philadelphia, New York and Los Angeles thus year. Other sources are confirming the rough schedule as listed in the IORR LICKS World Tour dates in Australia, but dates may change slightly as venues are finally booked. It seems like the Sydney dates might be February 19, 21 and 22 at the Superdome, a 21,000 capacity indoor olymcic arena in Sydney. The world tour dates outside USA and Canada will be publicly announced by the Stones late October.